Ashraf Ali Barcha, President, Ajuman Imamia: Ladakh is a small and compact society, and there are very few problems compared to such cases in other societies. We are far better and communal harmony in our region is an example to the whole world. The vision of our people should be widened in order to maintain harmony in the society. Sure, we make it a point to tell the people of our community to discourage marriage within other faiths. But it is impossible to understand each and everyone and to change their mind. Also, we cannot guarantee that such things will never happen in the future. And when a conversion case happens, we should act responsibly, as because of two people we cannot sacrifice the peace and harmony of our entire society. On the incident of conversion, be it a Buddhist to a Muslim or the vice versa, we should introspect about the issue, understand the reason and try to resolve it. The religious heads of all the communities should meet and resolve the problem internally before spreading it to a large scale. We have cases of penalties imposed on people who converted others to their religions. And there are many cases in which heads of the religions intervene and resolve the issue of conversion internally and the women get back to their parents peacefully. In the recent case, we cannot do anything because the boy is from Kargil, and it can be handled only through mutual talk with their religious heads. I have told the LBA that we are ready to help them and go to Kargil with them and still I am ready to help in resolving the problems. We cannot tell one not to embrace another faith and stick to one’s own religion. It’s their choice. One can also continue following one's own religion after marriage. •The foremost thing to prevent such cases depends on the moral education given by the parents. •The concept of religion should be understood among the younger generation. • Introspection in such cases is necessary to understand each other’s problem. • To keep communal harmony of the region intact, meeting of different religious heads of both Leh and Kargil should be held to talk about the issue and to minimise such cases of conversions. Tsewang Thinles, LBA President: Communal harmony in a society cannot be maintained by the efforts of only one group of the same faith; it needs the involvement of all the religions striving for peace and harmony in the real sense. There is no doubt of communal harmony in Leh, people have been working together, helping and solving issues together. Talking about the conversion and marriage of a Buddhist girl to a Muslim man, the family members of a girl were having problems, and out of helplessness, they approach the LBA for its support. We condemned the incident because the boy’s family got an order from the court that no one from the family members and even a single person from a Buddhist community are allowed to interfere and attend their marriage. The family members of the girl could not believe any version because they were not allowed to have even a single conversation with her. All this forced us to wonder whether it is actually happening with the girl's consent. If it is a case of love marriage, there might not be an issue because two people can decide as they like. The problem is the conversion of faith prior to the marriage which for us seems more like a conspiracy, and we are against it. The population of Buddhists is microscopic in number in the state of J&K. Besides that, the conversion of Buddhists to another faith has been going on in large numbers which can lead to the decline of Buddhist population, which is already in a minority. 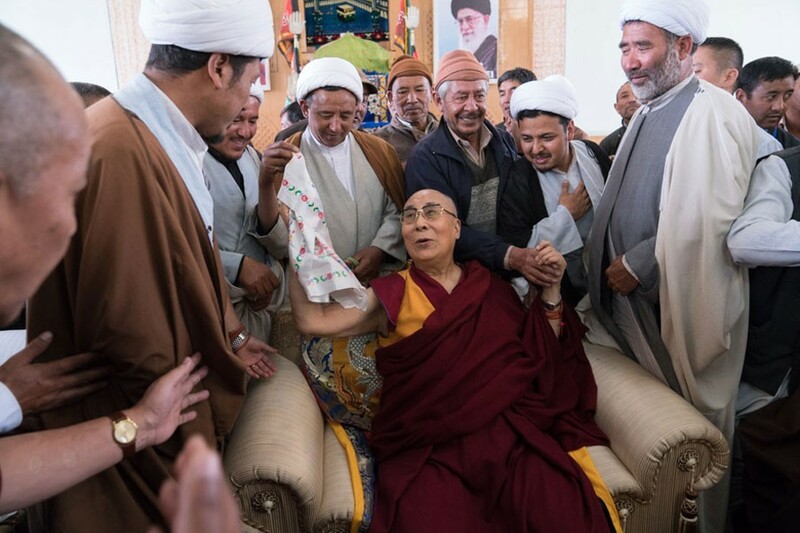 Like the Pundits, who had to flee Kashmir in the past, there seems to be a policy to dwindle the population of Buddhists by converting them into Islam systematically. Till 2003, around 97 Buddhists had converted into other faiths. The data from 2003 to 2017 is not yet available. A meeting with DC, Leh, and all the stakeholders was held in which we agreed to resolve the problem peacefully and along with it we put forward some of our demands to avoid conversion of faith in the region. We have raised our voice for the enactment of anti-conversion law as it is enacted in five other States of India. Also, we demanded a high-level committee to check the reason of conversion until today and to rectify the problems. This is because we also heard that one among the reasons of conversion is the kind treatment and offering of government jobs after the conversion to Islam in their society. There are also other factors which are somehow responsible for the conversion of faiths such as the lack of a good education system in our own region. For quality education, parents send their children outside for further studies. They spend most of their time with friends, get to meet many different people and relationship is built up, which may go beyond our moral values and principles. We are going to meet the PM, the Minorities Commission and concerned minister to address the negligence in the field of education in Ladakh. • An anti-conversion law needs to be enacted in J&K to protect the minorities. • All religious faiths should come together to solve the issues related to conversion. • The education system of Ladakh should be developed in order to minimise the sending of the students outside for studies. • There is a provision for minorities everywhere; it should be put into action. • A meeting with all stakeholders of Leh and Kargil should be held. In the recent case of conversion, the biggest point is that the family members were not allowed to talk and meet with the girl. I think it is against the law. There may be a chance for an amicable resolution of the case. Religious heads of both the districts could meet and find ways to at least let the girl meet her parents. It is important to keep in mind the sentiments of the people. There is an understanding within all the religions that we will not encourage things including interfaith marriages which can disturb communal harmony of Leh. Remembering the peace and harmony of our region, all faiths should work towards a better future by maintaining a good system to curb and help each other’s issues to be resolved. All faiths should meet and talk about it and find ways to minimise such cases. Ladakh, being a small region, where most of the people know each other, there are many things which can be internally resolved and mitigate the issues. A sense of communal harmony should be inculcated among the children from the beginning. Today the youths take decisions that undermine religions and faiths. If we wish to retain communal harmony in the region, not only interfaith marriages but all the factors that harm the cause of peace and unity of religions should be avoided. • Leaders and religious heads of both the districts should meet and discuss it. • The importance of life and faith should be inculcated among children. • Before taking any step, one should think about communal harmony. Dr. Abdul Qayum, President, Anjuman Moin-ul Islam: Cases like the recent interfaith conversion and marriage in the region should not be encouraged at all, keeping in view the sensitivity of the issue. If at all any individual wants to convert to any other faith, it should be by studying and understanding the particular religion as it is happening in the United States and the UK where people are embracing Islam, and in Europe Buddhism. However, it should not be taken as a threat to our long-standing composite culture of communal harmony for which we always give priority and it cannot be compared to any other parts of the country. Moreover, it is an act by two individuals not an act of any organisation or institutions; and we, as Anjuman Moin-ul Islam, never endorse such acts. We do not appreciate conversion to marry and also warn our youths in gatherings and sermons to stay away from such acts. Islam is all about equality and respect for other religions. The role of religious heads should be to educate and do the right counseling to our youths along with parents to stay away from such acts. All religious heads should not argue but need to sit together and discuss thoroughly. Lastly, the law of the land should prevail and nobody should take law in his hands, and it is the duty of an administration to be vigilant enough to act quickly to resolve such issues. •Problems and issues regarding communities should be amicably resolved together. •Awareness, education and counseling are needed within the respective community about the value and importance of one’s religion along with respect for other faiths. •Coordination and communication among communities is a must, regularly.